What is Xtendlife Female Rejuvenator? 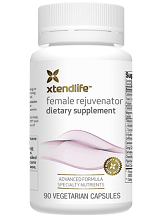 XtendLife Female Rejuvenator is one of the solutions on the market that claim to support female health and wellbeing. The product makes many claims, such as relieving PMS symptoms, promoting female reproductive health, supporting healthy hormone levels, managing the frequency and severity of mood swings, helping to deal with menopause discomfort, promoting natural hormone balance, boosting vitality, enhancing female vitality, boosting libido, and helping to solve sexual problems. The aim of this article is to provide you with the accurate facts that will enable you to make a smart purchase decision worth your money. The manufacturer recommends that 3 vegetarian capsules should be taken a day for adult women. It is recommended to take the capsules with food in the morning or split into 2 doses, one in the morning and another dose later in the day. It is unclear how this split will work when three capsules a day need to be taken. This product retails at $29.95 for a pack of 90 capsules for ordinary purchases. When we checked the manufacturer’s website, we saw a special member’s price that allows them to buy this product at $26.96. You can sign up to become a member through the manufacturer’s website. Becoming a member enables you to have the products you purchase automatically shipped to you each month. So far, no known adverse side effects accompany this product. However, the manufacturer advises that all pregnant and breastfeeding mothers need to get the approval of a doctor before taking this product. Also, if you are using other prescription medications, consult a doctor before commencing the dosage. They also encourage potential users to read the product’s ingredients list carefully before using this product. This product comes with a 1-year money-back guarantee. This is a very good guarantee that can help put a first-time buyer’s mind at ease. The manufacturer’s website has 9 user reviews that give it a 5-star rating, however, we were unable to verify these reviews. XtendLife Female Rejuvenator appears to be a great female product. It comes at an affordable price and gives a buyer a 12-month money-back guarantee that allows a customer to enjoy a secure fallback if the product fails to work. However, a few missing links in the product can cause a customer to look for alternatives such as its lack of verified user reviews from trusted online retailers.